Nimbus Ultimate Wheel – Possibly The Simplest Ride On Earth | OhGizmo! Short of going for a spin inside a giant inner tube this unicycle called the Nimbus Ultimate Wheel is probably as simple as you can get when it comes to a mode of transportation you can actually control. 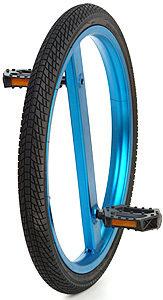 It does away with the seat and other frivolities on a standard unicycle and is basically just a wheel with with an offset pedal on each side. The bare bones design and lightweight aluminum frame means the Ultimate Wheel is great for commuters who like to bring their bike into the office or store it in their apartment but like the unicycle I just don’t see this catching on. But if you’d like to try your hand at snapping your ankle the Nimbus 20-inch Ultimate Wheel can be found at Unicycle.com (where else?) for $74. And if you don’t think this contraption is actually ridable I’ve included a YouTube video after the jump that proves otherwise. HAHA! Yeah it’s TECHNICALLY ridable, but look how much trouble those people are having and I bet they have had alot of practice. Most of them seemed pretty controlled, and you dont need to coast. Unicycles are getting into a big sport now, and those dont coast, and another big fad going on right now are fixed speed bikes. NO coasting on those either. Nothing wrong with constant pedaling, you dont really realize your doing it either. i dont see any off these unicycles on the vid. sorry if im blind but dont they all have seats in the vid?